ST. PETERSBURG, FL -A group of cyclists in hot yellow T-shirts was launching from the sidewalk outside the patio of The Dome Grill. I had noticed quite a few bikes when we arrived, but my head was in my Blackberry and I didn’t think much of it. 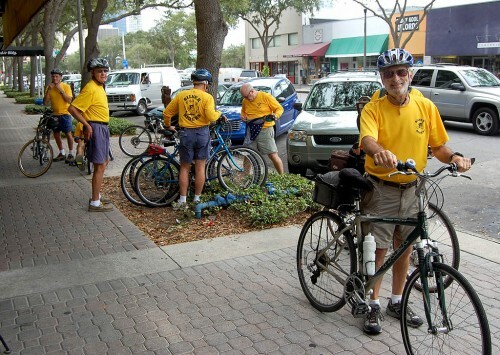 Bikes – and bike stands – are everywhere in St. Pete. I grabbed my pen and ran outside to get their story. Right off the bat, I figured this was a men’s group of “a certain age.” All the guys were buff and tan, but most had snowy hair atop their pates. Several laughed – then pointed at the guy in front of me. “I guess I am,” said Rudolph Oswald, of Seminole. The main group typically rides 25 to 30 miles once a week on Tuesday. They were at a halfway point at the Dome, with 16.8 miles under their seats. A smaller group rides a second time on Thursdays, he said, 30 miles or more. Most rode hybrids; a few have bents, Oswald said. The one bent rider on this ride uses arm power to compensate for a bum leg. With the Pinellas Trail that runs the length of the county, and numerous other bike trails snaking off it and along the water, this is one friendly area for cyclists — you see them everywhere. Because they ARE so common, cars seem to be more courteous to them than over here on the east coast of Florida. 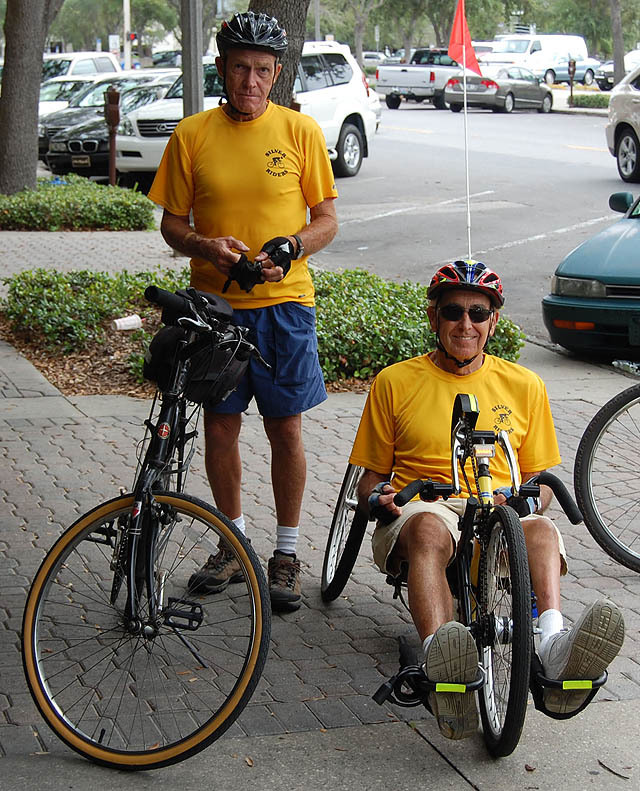 “We have about 20 different trails to ride, all over the county,” Oswald said. He added that quite a few of the riders had taken a first-aid and CPR courses as well, so they were prepared for emergencies. And of course, they have cell phones. They had stopped at the Dome to eat and fill their water bottles – they’d need them this day: the heat and humidity were oppressive again — Ida’s remnants were being felt all along the Gulf Coast. Though there was some wind, it wasn’t nearly like the near gale we’d encountered coming over on Monday. This was one of the cheeriest groups I’ve met in a while – all pedaled away, smiling and laughing. Not sure how to contact them to catch a ride with them, but if I get over there again on a Tuesday, I’ll keep an eye out. Maybe one of them will find this online and comment to let us know. I am not in shape enough to go that many miles. 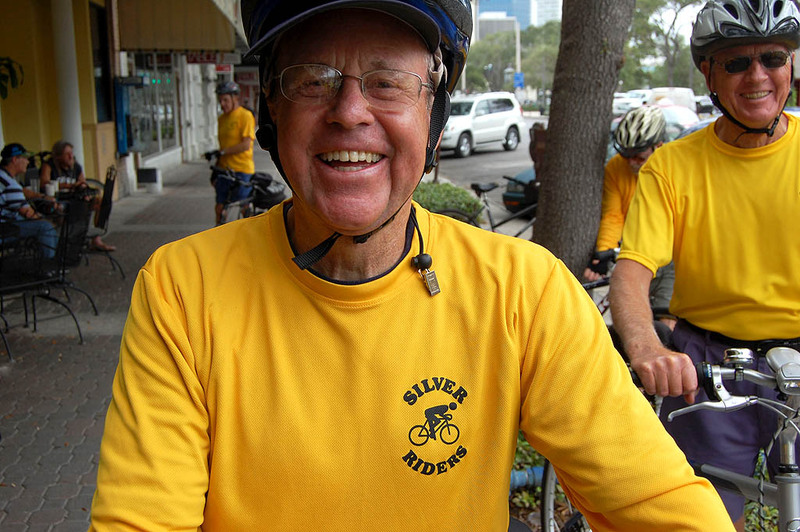 Do you know any senior bike club that goes 10 or 15 miles, St Pete, Maderia, largo area? We’re a Club of One. Put on your helmet, climb on your bike and ride.